Last couple of weeks have been really busy. I needed to get some work done on the house (painting, shelving etc) ..so was busy running around getting quotes.. I have been making some quick, healthy and simple dishes . 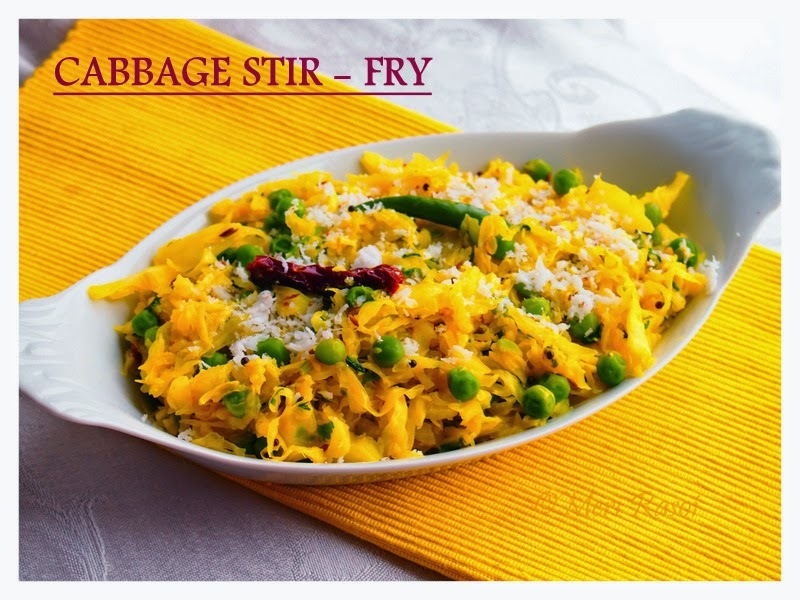 One such dish that I made yesterday was CABBAGE STIR FRY.. This dish does not need too many ingredients and goes well with Dal and rice and so also with some hot phulkas. In this dish, I cook the cabbage in a way that it is tender but still has some crunch to it. Its important that you shred the cabbage finely.That way they take less time to cook. Heat oil in a pan . When hot, add the cumin seeds, urad dal, mustard seeds, dry red chillies and curry leaves. When the seeds splutter, add the shredded cabbage. Increase the heat to medium-high. Add the cooked peas and give it a good mix. Add the turmeric powder . Once the cabbage has turned tender but still has a crunchy bite to it, add in the salt and sugar. Mix well. 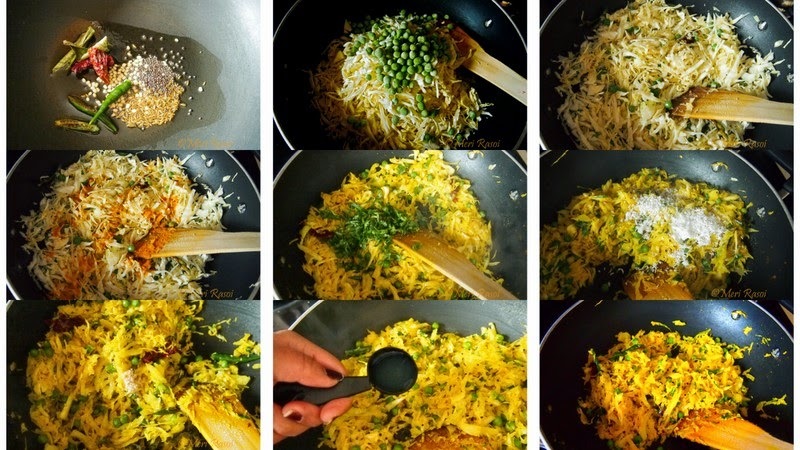 Add the grated coconut and cilantro and mix. Add asafoetida. Lastly, add the lemon juice. Serve with Rice and Dal / Sambar or with hot phulkas. 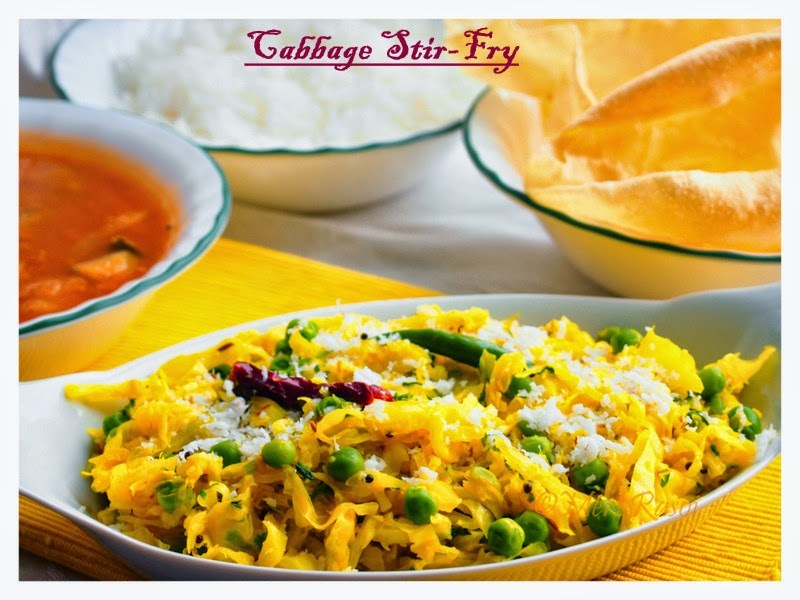 To learn another way to make cabbage sabzi, click here. Thanks Nootan!! I also cook cabbage in few other ways too.. Sometimes make cabbage sabzi with onion tomato ginger combo..This one is a simple stir fry.. I never added lemon juice to stir fry..Stir fry looks yummy. 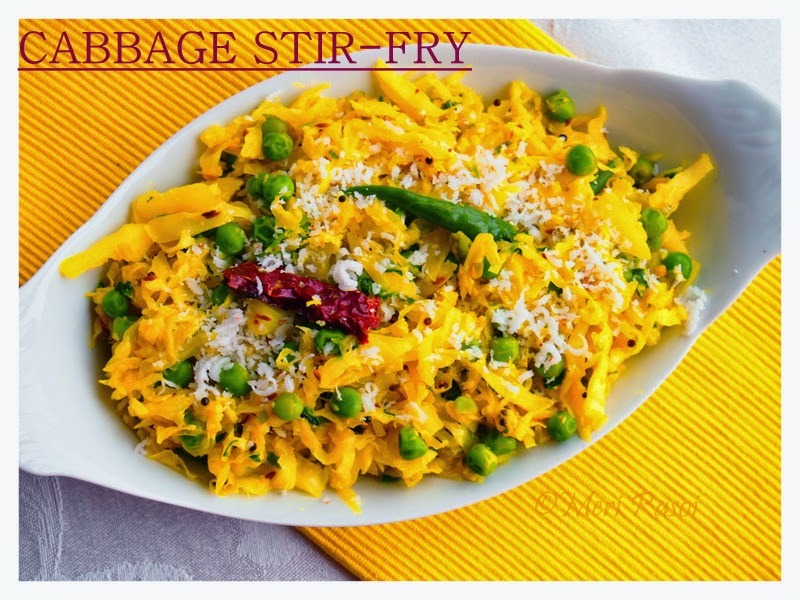 Thanks Sathya:) I have another cabbage sabzi recipe on the blog, where i have used tomato..
delicious looking plate, and tempting cabbage stir fry, Shubha! I make it often but never tried it with coconut. good idea! Looks so enticing, Perfect for light lunch. Its an ever loved dish. nice color n healthy fry..
One of my favorites, I like serving it as a slaw with burgers and sandwiches. Great recipe, Shubha! Wow. serving as a slaw is a brilliant idea:) Thanks Peri!! 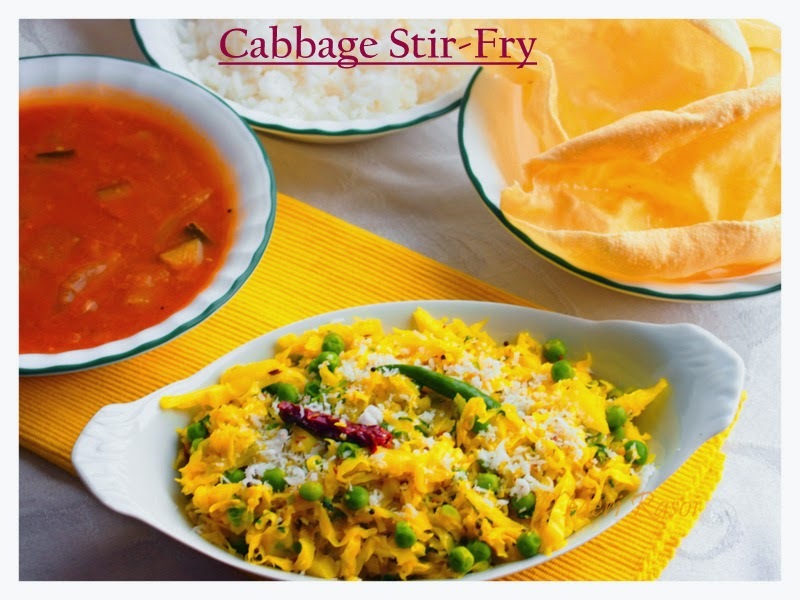 Not a great fan of cabbage but those clicks are tempting me:)...Don't mind having with coconut! !